The name "birches" reflects the unique country environment and atmosphere we and our customers have always enjoyed. 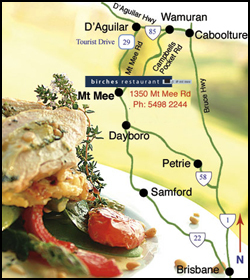 Nestled on top of picturesque Mt Mee this wonderful licensed restaurant enjoys spectacular views of the surrounding rural countryside and out to the Redcliffe Peninsula, Moreton Bay, Moreton Island and beyond. 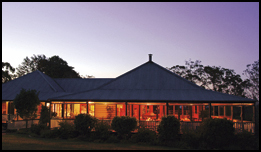 Whatever the season, day or night, you will enjoy the ambience our unique Queenslander provides. 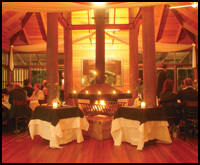 The restaurant provides a large open area featuring a high raked timber ceiling, solid brushbox timber floors and the centre piece being a magnificent fireplace. Wander through open glass french doors to large verandahs where a relaxed café style awaits you. The environment that greets you is one of harmony between an abundance of wildlife and the countryside. "We are a team in the kitchen. Using the freshest and highest quality ingredients, we prepare and cook everything on site to create innovative, generous and delicious meals. Variety is the key and catering for all tastes and needs is important to me". We really enjoy special occasions. 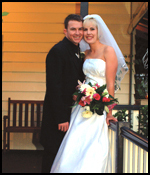 Our facilities lend themselves to groups, and our garden particularly, to that special day. Weddings are our speciality. Featuring live entertainment our "Christmas in July" is always very popular. We share our peace and tranquility with a quaint country church. It is a stroll across the road, with a personality all of its own. 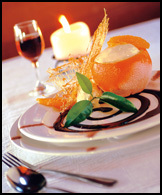 "We take pride in our personal attention to detail, warm hospitality and service". 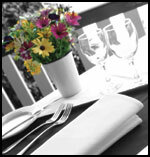 Wednesday to Friday- from 10am lunch & dinner, Saturday - breakfast, lunch and dinner, and Sunday - breakfast and lunch. Internal Restaurant - 80 in an open plan environment. Outside Verandas - 60 featuring drop down clear blinds to protect from unforeseen inclement weather. Surrounding Gardens - suitable for special occasions, particularly weddings, featuring shady trees. Bar - stocked with a wide selection of the finest wines. Café - great espresso coffee, large selection of teas and great home made goodies, available all day. Dietary - all requirements catered for including vegetarian. Kids - are very welcome and happily catered for. Parking - for cars, coaches and motor bikes. Payment Options - EFTPOS, Mastercard, VISA, Bankcard and cash is welcome. Ideal Season - Summer, Autumn, Winter and Spring. NOTE if your email is to book a table in the next 24hrs please phone to book.